» Emergency NBA Overnight: Royalty in Brooklyn, Roller Coaster in Washington, and a Buzzer-Beater in L.A. Normally, we save NBA Overnight for the playoffs, but last night was just too ridiculous. There was too much amazing happening all over the league. So here we go: a rundown of a meaningless night in December that also explains everything about what makes the NBA so great. The Cavaliers played in Brooklyn last night, and for a while it was close, but then in the third quarter, LeBron and Kyrie and everyone else just broke the game wide open. A one-point Cavs lead at halftime turned into an 18-point lead going into the fourth quarter. It was around this time the game stopped being interesting, and all you could do was watch and wonder. The Cavs have won seven straight? The offense everyone was worried about is blowing people off the court? Kyrie has looked amazing the past month? Maybe this team is better than we thought. Even Dion Waiters looked great last night. He had 26 points and was trash-talking people from the bench, which is really the perfect Dion Waiters night all around. There will still be nights when the offense grinds down and LeBron looks disturbingly mortal. It’s easy to pick holes in the Cavs — like last Thursday, against the Knicks. But they found a way to win that game, just like they’re finding a way to win most games now. Even if this isn’t quite the juggernaut some people were expecting, and even if there are still off nights, it’s gotta be a good sign that the “on nights” have them blowing teams out as a rule. Players wearing “I Can’t Breathe” shirt: LeBron James, Kevin Garnett, Kyrie Irving, Deron Williams, Jarrett Jack, Alan Anderson. Honestly, my favorite part of this was knowing that no matter what happened, this wouldn’t turn into some huge controversy that plagued us all for the rest of the week. NBA fans are fine with players taking political stands, and they even encourage it, and that’s a good thing for everyone. DID YOU KNOW: It’s considered a faux pas to touch British royalty? 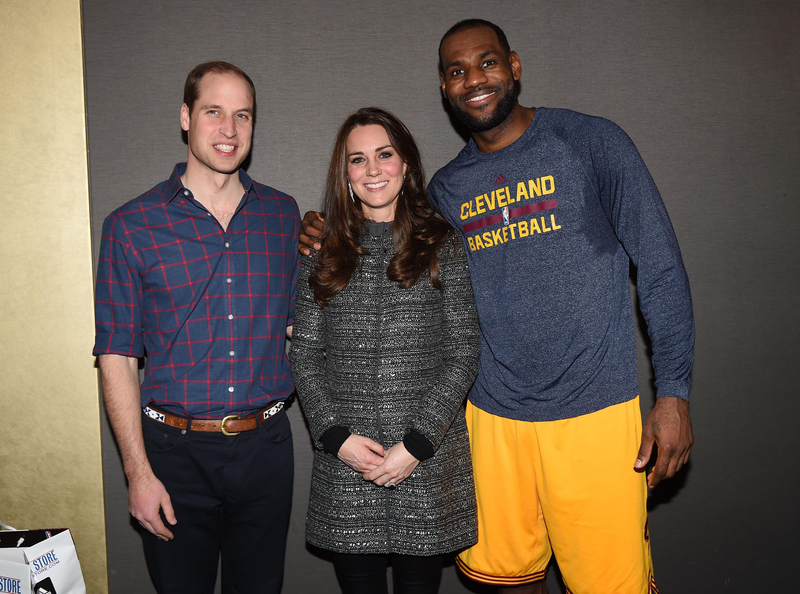 Basketball player LeBron James may have scored a slam dunk for his photo album, but he put himself in danger of being struck off the royal Christmas card list by putting his arm around the Duchess of Cambridge. Etiquette expert William Hanson told MailOnline that although the Duchess is unlikely to give Mr James the cold shoulder, he still should have kept his arm away from her. That takes an otherwise forgettable postgame photo op and makes it so much better. 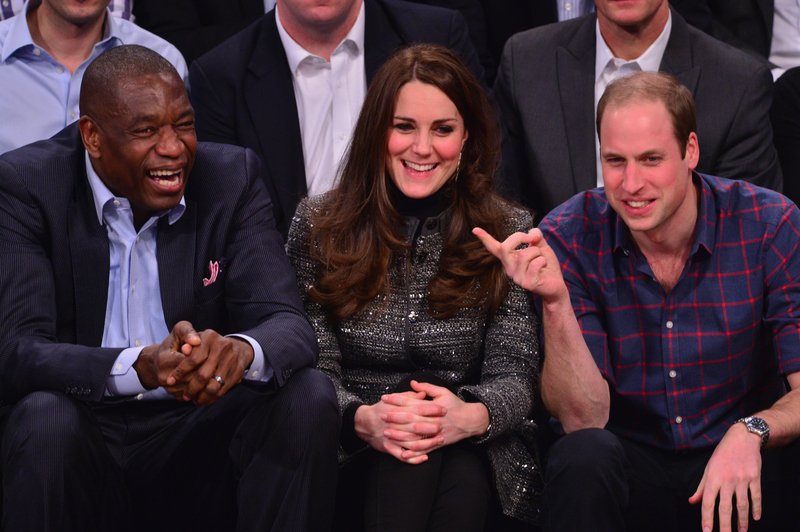 All due respect to the meeting above, but Dikembe and Kate Middleton are even greater than LeBron and Kate Middleton. I would pay a good $200 for a full podcast of their conversations from last night. Or just a regular podcast in which they talk about world affairs and fashion and basketball. Prince William can moderate. It was a great night in Brooklyn. How did we get to a place where Evan Turner turned into Ray Allen? I don’t know. There are no good answers. It was just that kind of night. The Wizards had been up 23 points, allowed Boston to come back, and nearly gave me a heart attack. Then it went to two overtimes, before John Wall won it in the end. Wall had 27, 17 assists, and seven rebounds, Paul Pierce added 28 points, and the Celtics scored 82 points off the bench to make it close. This should’ve been a blowout for the Wizards, but what it turned into instead was so much dumber and so much more fun. Here’s the thing about the NBA right now: If you stay up late on the East Coast, you’re pretty much guaranteed at least one game from the Western Conference that looks like an entirely different sport. Last night was a perfect example. The Cavs-Nets and Celtics-Wizards games were fun, and then the Clippers and Suns had to go supernova and remind you that the West is on a completely different level right now. Eric Bledsoe had 26, 16 assists, and 11 rebounds, and at the end of the fourth quarter he took Chris Paul’s game winner and sent it into the seats. This whole game was proof that the Suns are still very fun, and very much a playoff contender in the murderous West. With Isaiah Thomas injured the past few games, Bledsoe and Goran Dragic have come alive again, and the Suns look every bit as dangerous as they did last year. The Morris twins are hitting 3s — which still doesn’t feel normal — P.J. Tucker is a grimier version of Draymond Green, and Gerald Green continues to be in dunk-contest mode at all times. It’s all clicking better than people realize. You could say the same for the Clippers, who started slow and forced the whole world to reconsider their Finals predictions. Now they’ve won nine of 10 games, and suddenly they look like the Clippers again. It gave Blake 45 and eight on the night, plus the rattled-home game winner. If Anthony Davis had done this, we’d be rioting in the streets right now. This is your reminder that no matter what happens, Blake Griffin is every bit as freakish as anyone in the NBA. Keep him in the NBA forever, just for the reaction shots. Theory: Big Baby wasn’t even reacting to the game here. Someone in the crowd yelled “PANCAKES!” and his face just did that instinctively. You will see this interview everywhere today, and there’s not much more to say. I got emotional watching it last night, and I got even more emotional reading up on Wall’s relationship with Miyah. These pictures make me even more emotional a day later. The NBA is the sport that allows us to know players more intimately than any other, and last night we all got to know John Wall better than we ever expected. All I can say is that Wall’s game coupled with that interview took me to a very dorky, sentimental place as a Wizards fan. I was thinking back to the insane controversy over the Dougie and whether a single-parent household would doom Wall. I remembered his nagging injuries the first two seasons, that one year he shot 7 percent from 3-point range, and even last year, when he broke through to shock the Bulls, but then fell apart against the Pacers. All of it makes this season even sweeter. There’s just nothing better than watching Wall right now. He’s not the best, he’s not the most polished, and he’s still got plenty of room to get better, but what Wall’s become is already more than I could have hoped for. When you’re looking for a franchise player, you hope for two qualities: You want someone who genuinely cares about the city, and someone who genuinely cares about the team. You want someone everyone can get behind. And you want someone who’s so good, he can take over games by himself and amaze you on a nightly basis. When you’re looking for a franchise player, you hope for someone exactly like John Wall. Last night was just a little more proof.